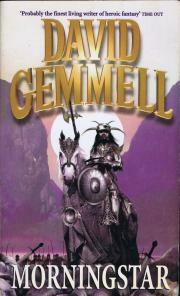 As the Angostin battle hordes surge over the Southern Borders of the Highlands, the bandit, Jarek Mace, and his friend, the magicker and bard Owen Odell find themselves in a country in desperate need of heroes. The invaders have no respect for person or place, stealing and laying waste to everything in their path. Behind them evil sorcery is unleashed as a mad necromancer brings back to halflife the eons-dead Vampyre Kings. 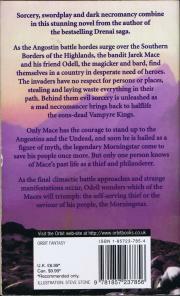 Only Mace has the courage to stand up to the Angostins and the Undead: soon he is hailed as a figure of myth, the legendary Morningstar come to save his people once more. But only one person really knows Mace: Odell remembers how the now famous bandit was once but a thief and philanderer, who would as soon cut a purse string or a throat for the price of a meal. As the final climactic battle approaches and strange manifestations occur, Odell wonders which of the two Maces will triumph: the self-serving thief or the saviour of his people, the Morningstar.